Take a gander at our new holy water font for the church or chapel. Quality craftsmanship at an affordable price. 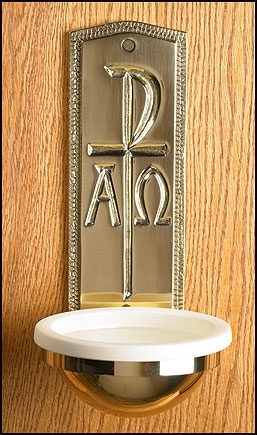 Can be engraved, making it a thoughtful memorial gift to the church. The Chi Rho is one of the earliest forms of a Christogram. The Chi-Rho was found in the catacombs, on ancient lamps,and elsewhere. letters Chi and Rho (ΧΡ) of the Greek word “ΧΡΙΣΤΟΣ” (Christos) in such a way to produce the monogram.